David Schofield has been drawing for the better part of 40 years. His first subjects were private homes and churches in the Chicago suburb where he grew up, and were an early indication of his strong interest in architecture and built structures. After a brief time studying marine biology in Florida, he took several art classes at the Pennsylvania Academy of the Fine Arts and then supported himself selling sketches door-to-door to people who he persuaded that he could draw them or their pets or their homes. 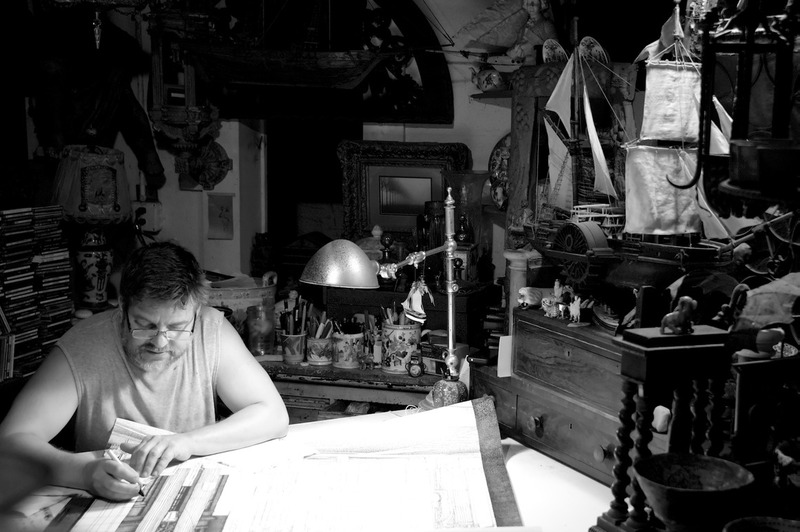 He began to develop a more personal and inventive style and in 1979, when he was 21, he had his first solo show in Key West where he had established his studio and where he has lived and drawn ever since. His first New York City show followed 4 years later in 1983. David's earliest large-scale work was of Manhattan cityscapes: entire blocks of classic (and often decaying) brownstones and elaborate cast-iron facades. Many of the drawings are very large (see the photographs on the right and note the dimensions on each drawing in the galleries) and all are ambitious, highly detailed, distinctly original and immediately fascinating: they invite close examination for their intense and elaborate intricacy. Each very large drawing can take at least several hundred hours to complete. David uses pen and ink on snowflake parchment with a Koh-i-Noor Rapidograph size 00 point that he files so that it pierces the surface of the parchment which allows the ink to be absorbed. At first the drawings seem to be faithfully-detailed renderings of the scene; a closer look reveals what David calls “secondary elements”: litter, graffiti, discarded furniture, and visual puns, as well as personal references to his family and friends or to his travels or to something he has read.